This spacesuit was worn by Russian cosmonaut Alexei Leonov during the historic Apollo-Soyuz Test Project, a joint space mission between the U.S. and Soviet Union in 1975. It is one of two spacesuits up for auction in the Bonhams Space History Sale in New York City on May 5, 2011. 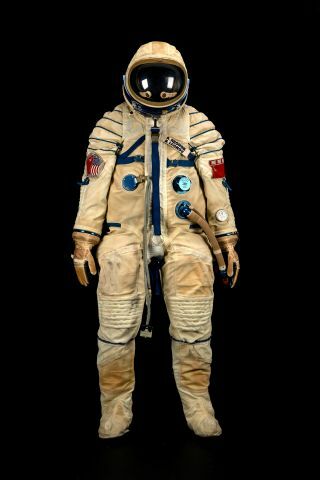 NEW YORK — A vintage Russian spacesuit worn during historic Cold War-era spaceflight by a Soviet cosmonaut sold for $242,000 yesterday (May 5), making it the most expensive prize in an auction to mark 50 years of American spaceflight. The auction was based at Bonhams' Manhattan showroom and offered up a dazzling menu of items from the poignant to the quirky, all with a compelling space story behind them. Buyers online and on the phone also took part. The top seller of the day was the spacesuit worn by cosmonaut Alexei Leonov during the historic 1975 Apollo Soyuz Test Project, a mission that marked a symbolic end to the space race. But it was a single-typed sheet of paper, marked with hurried scrawls of red and black ink, that sparked one of the most aggressive bidding wars of the day, Haley said. "It was a great battle — really exciting," Haley told Space.com. The object of buyers' lust was a small page of contingency steps from the ill-fated Apollo 13 mission, marked over with revisions by astronauts James Lovell and Fred Haise as the two men struggled to adjust the lunar module's engine burn and bring their faltering craft safely back to Earth. It sold for a hefty $111,000. "We were pretty taken aback," Haley said. The document was expected to make about $30,000. "But as the auctioneer said, 'You're not going to find another one of these,'" Haley said with a laugh. Indeed, although humans are poised to return to space any day now, it's unlikely chimps will ever travel there again. Haley said the items from the estate of James Webb, NASA administrator during the 1960s, sold well to eager buyers, including several letters from President John F. Kennedy. Andrea Mustain is a staff writer for OurAmazingPlanet, a sister site to SPACE.com. Get the latest space exploration news by following SPACE.com @Spacedotcom and on Facebook.